You must stay at Greenlinks Resort to play this course. Designed and built by one of the great masters - world-renowned golf course architect Robert Trent Jones Sr., the Lely Flamingo Island Club is Naples' only RTJ Sr. signature golf course. Golfweek has twice designated the course as one of "America's Best Public Courses", and has earned Golf Digest's Four-Star "Places to Play". With its hourglass fairways, fingered sand bunkers and large undulating greens, the golf course is destined to provide many exciting challenges. Playing from a length of 7,218 yards from the tips, the course features 3 sets of tees for an enjoyable and challenging round for all golfers. The signature par-3 fifth - "Flamingo Island" hole - will leave you in awe - surrounded by water and accessible only by bridge. Links Magazine quoted golf legend Gene Sarazen as saying, "The Lely Flamingo Island Club is the best in Naples." Play it for yourself - we're sure you'll agree. You must stay at Greenlinks Resort to play this course. Lely's Mustang course is a legend in the making. Designed by Lee Trevino, Mustang is a course that follows his philosophy of making the game challenging - but a fair challenge - for the average golfer. The course offers a variety of golf holes that are difficult to a point, but always fun to play - where a player can always recover from an errant shot. Punctuated by 12 sparkling lakes, the Mustang gently flows across undulating fairways and winds through stands of towering Florida pines. Strategically placed bunkers will test your decision-making prowess as well as shotmaking abilities. The course features five sets of tees and will test the best players from the tips at 7,200 yards. 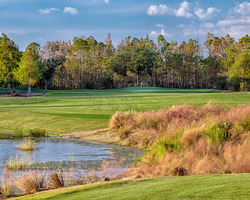 The Black Course has a very distinctive look with its pine straw-lined fairways, crushed coquina waste areas and undulating greens nestled amidst acres of pine trees and native Florida foliage. 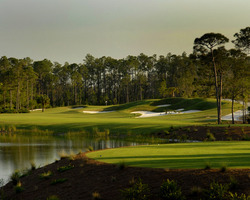 Playing to a length of 6,949 yards from the Championship tees, The Black Course features six sets of tees to challenge players of all levels, and follows Greg Norman's philosophy of maximizing the natural allure of the land to produce a pleasing atmosphere in which to appreciate the finer aspects of the game. Designated as a Certified Audubon Cooperative Sanctuary by Audubon International, The Black Course strives to protect and enhance its natural surroundings. Tiburón Golf Club is adjacent to the highly acclaimed Ritz-Carlton Golf Resort, Naples. Please note a forecaddie is required November - April 7:30 am – 12:00 pm ($25 recommended gratuity per player).